It started out a trip to lose old memories. It became a journey to find her heart. Leslie Malone faces an empty, lonely summer. Her marriage is over. Her daughter is overseas, living her dream. Her students are enjoying a carefree summer break. What's the purpose of her life if she's not a wife, mother and teacher? The idea of a roadtrip beckons her. Aimless wandering? Or inspired discovery? A woman of faith, she asks God for His guidance, then does her best to follow His direction. Hank Harrison is a quiet man, good with his hands, but short on words. He's paid a heavy price for not forgiving his son for horrible mistakes made years ago, mistakes with vast consequences. Leslie is an answer to his prayers, and together, they begin to mend their futures. Neither of them plans to fall in love. Will the worst summer of Leslie's life become the season that redeems them both? Roadtrip to Redemption starts off as a bittersweet story, but ends so much more. The title is an excellent description of this story as the MC, Leslie, takes a road trip for the first time on her own shortly after a heartbreaking divorce. She goes back to a place full of childhood memories, which was where her extended family stayed together in a house along the beach. 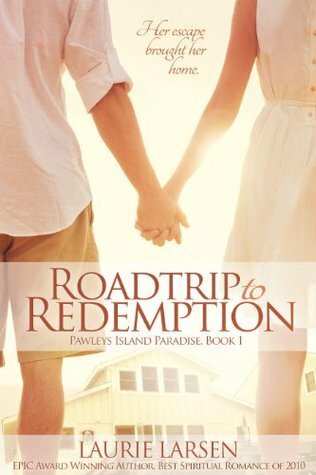 I loved reading along for the ride and then getting to know the people in Pawleys, who she becomes very close to. There were some heartbreaking moments throughout the story. Leslie had to find out who she was without her husband of over twenty years. She had to move on, sale the house, and figure out what the future held for her when what she thought it held had drastically changed. I loved how strong she was in her faith for most of the story and that she strove to find happiness. There were some inspirational moments that were a little strong - I'm not much for prayers being written out in stories, but this was the only thing I didn't like about it. I loved these characters! I loved Leslie and Hank, Hank's family (especially his daughter and grand-daughter), and Leslie's daughter. Hank had such a calming presence. He was a gentleman with southern charm, loved his family, was hard-working, caring, and willing to risk his heart. Leslie was full of heart, sweet, but strong. Overall, this was an enjoyable story that touched my heart, made me sigh, and left a smile on my face. I would recommend it to those who enjoy reading inspirational romance with heart and a happily-ever-after ending. Content: There is one suggestive part, but nothing comes of it. This is an adult book and so there is some slightly mature subject matter, such as dealing with divorce. I would consider this clean for the genre. If you'd like to read an excerpt or find out more about the author, you can do so here. It sounds like a good read. I love a good cast of characters and something that will leave me feeling good in the end. I love contemporary, too. There aren't enough contemporary Christian books, I think. Did it ever make me want to take a beach trip!!! We're about six hours from one. I wish we could go all the time. :) Thanks for letting me review your book, Laurie, and for stopping by! I liked that the characters were older, which is a little new for me, but that I still felt that fresh love and new beginnings vibe that I love. I agree! I liked that there wasn't anything too intense so that it was enjoyable and non-stressful, but also quite lovely. Thanks! I hope you enjoy it too when you get the chance to read it.